What are you going to do with all the beautiful small pieces of fabric left after making a sewing project? You don’t want to toss the fabric, after all it is new fabric and you love the texture, color or print. If you aren’t a quilter, and have no desire to make a quilt, you are just adding to your fabric scraps. I know exactly how you feel. I, also, have these scraps of fabric and although I admire quilts and quilters, I don’t feel I have the patience needed to make a quilt. So, when I started searching for scrap fabric uses, I looked for quick, easy and no-sew ideas. Also, the scrap fabric project needed to include a picture and directions or tutorials to make the craft. In this article I’m sharing with you the ideas I found that met the criteria. 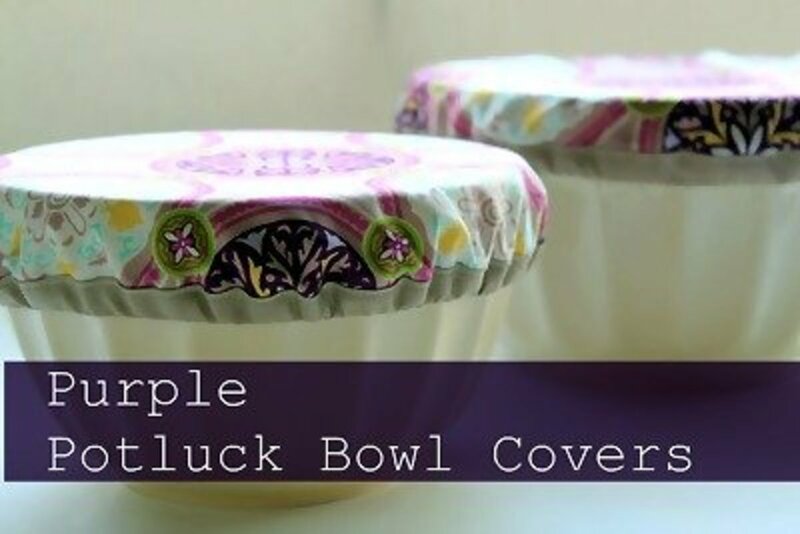 Find the tutorial for making the finger pot pads shown here, go to crafty asian girl. When you need a filler gift, one that isn't expensive to make, this is a great idea. 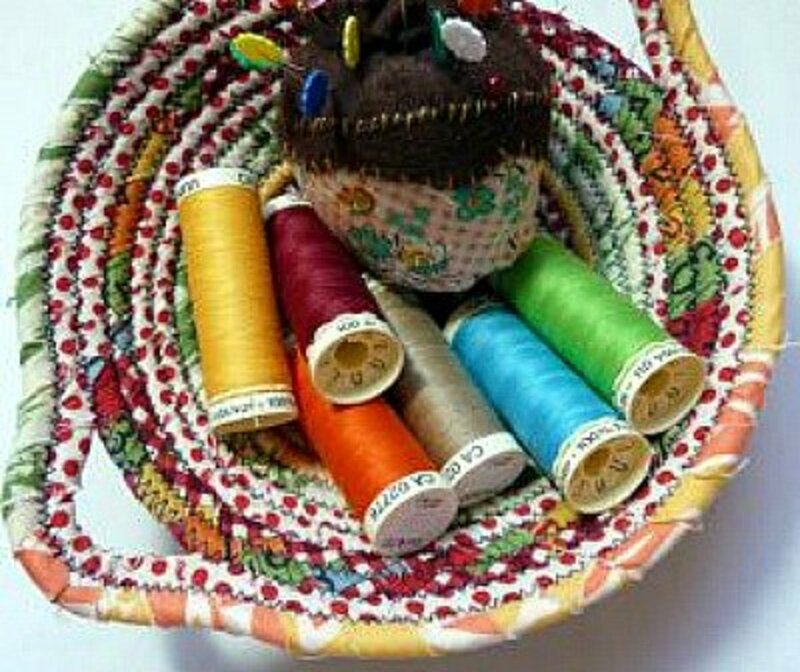 Add a pincushion to a bridal shower gift, a baby gift, to put in a Christmas stocking, a graduation gift, etc. 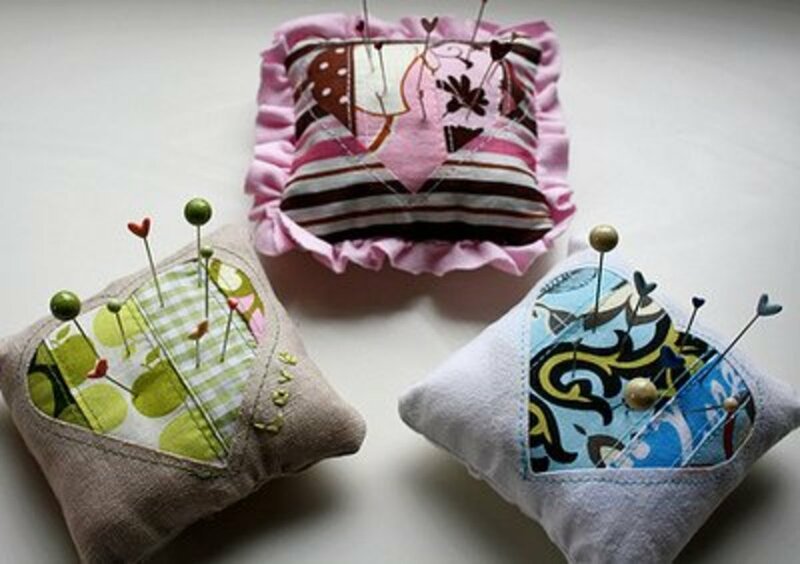 Make these useful, and cute, pin cushions by following the instructions at happytogether. 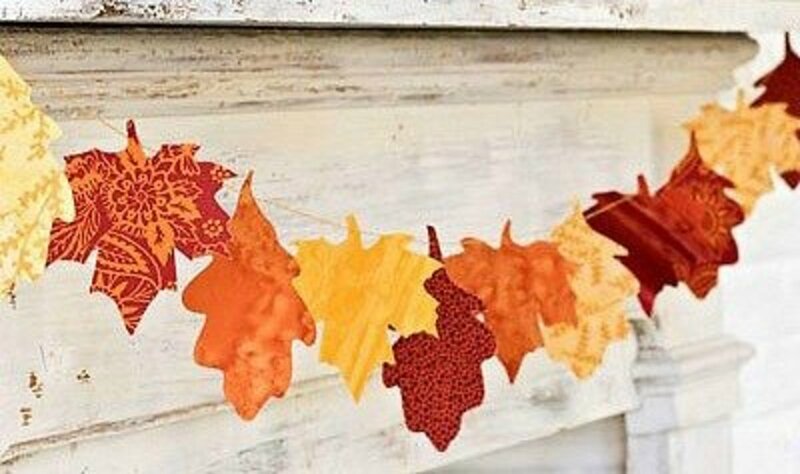 Decorating for fall will be easy when you use a beautiful leaf garland as part of the décor. You probably have lots of small fall fabric scraps that are perfect for this project. Go to the Good Housekeeping site for the instructions. 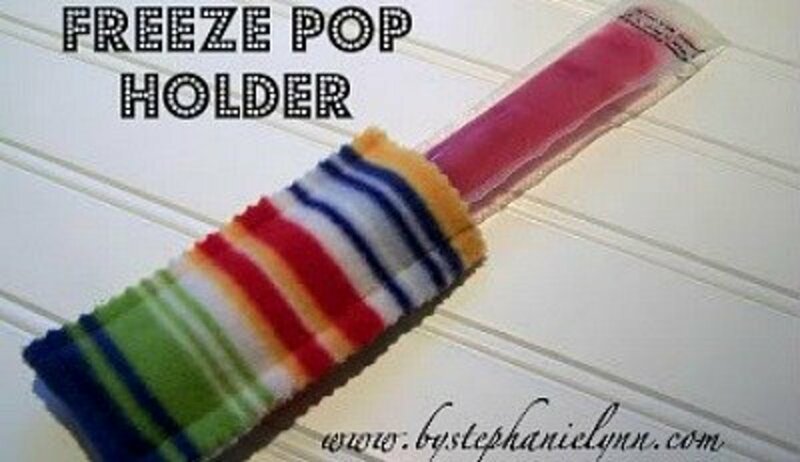 Not only is this freezer pop cover a useful item, it also is a great way to use leftover polar fleece scraps. You'll find the instructions for making these freezer pop covers at BY STEPHANIE LYNN. Make these love bugs for Valentine's Day, Mother's day, Father's day, any and all holidays, birthdays, baby gifts, shower gifts. The possibilities are endless. 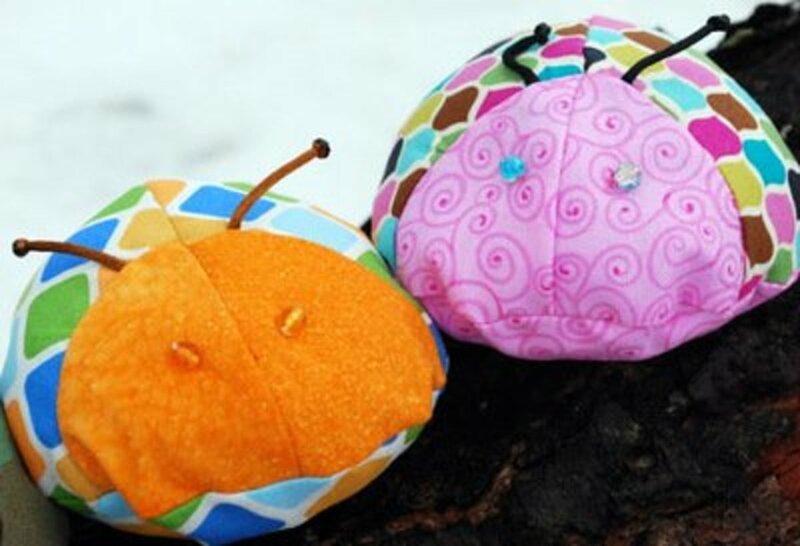 The pattern and tutorial for these cute little love bugs is found at taidye original. These carrots are so impressive and would look great in a bowl for a table centerpiece, and not for Easter only. 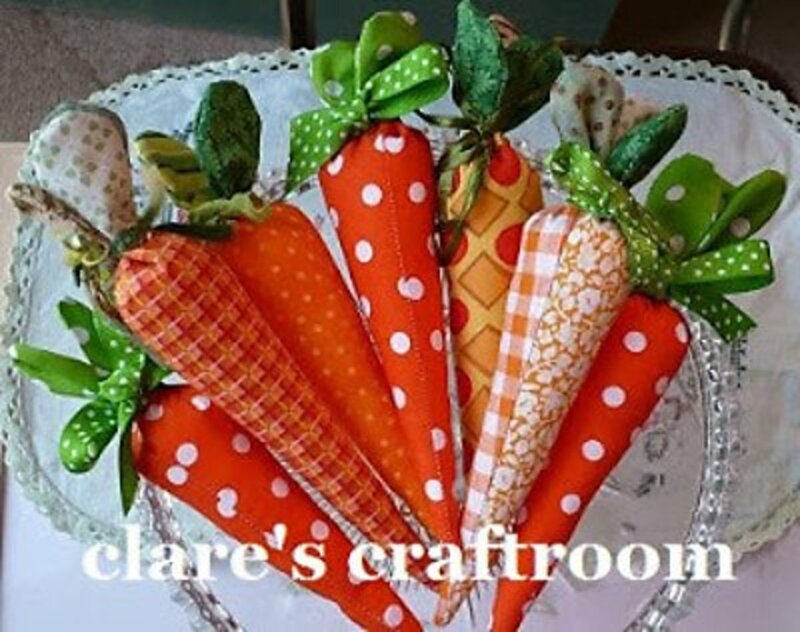 Check the tutorial at clare’s craftroom to make these fabulous fabric carrots. Making a crossbody purse to co-ordinate with your casual outfits will not only be useful, but also very fashionable. 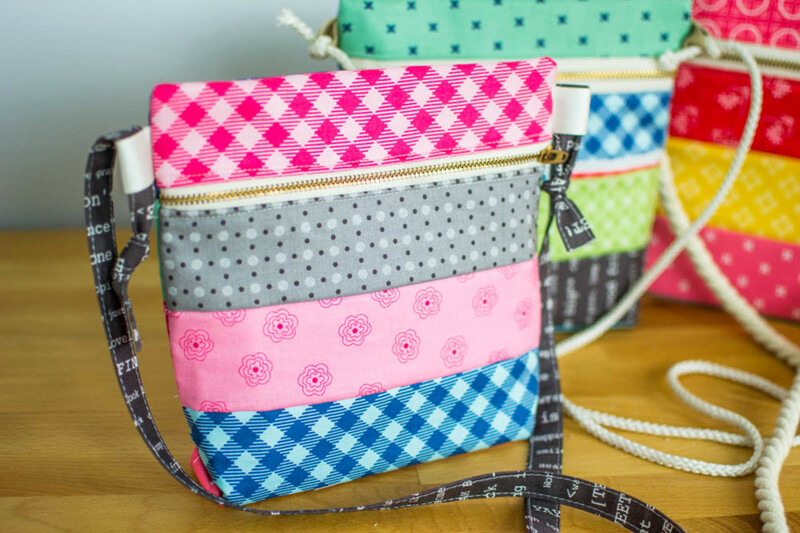 Sew Can She has a great tutorial to help you make this purse. 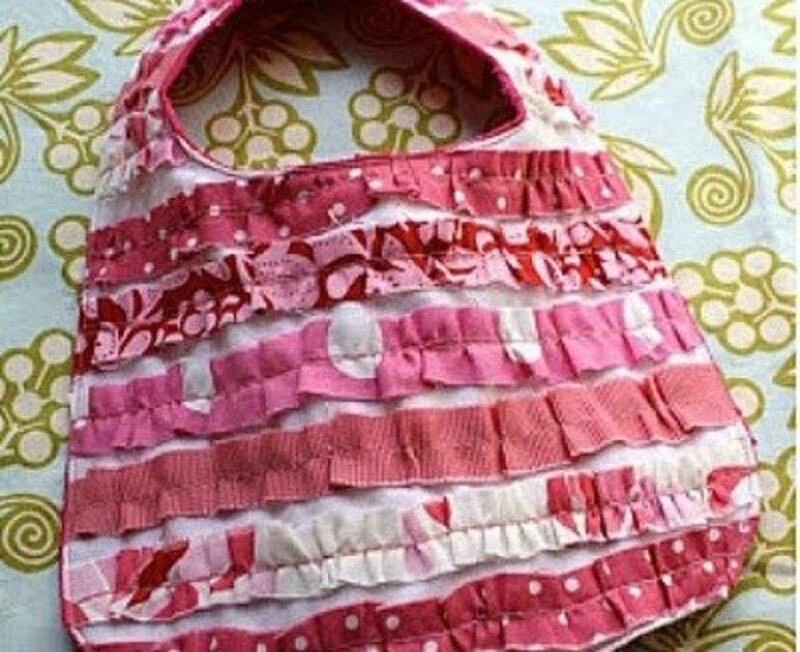 At CRAFTINESS is not OPTIONAL you'll find the instructions for making this ruffled baby bib. If you like the shabby chic look, don't hem the edges of the ruffles. If you like a more finished look, one that will take many washings, be sure to hem the fabric strips before gathering and sewing to the bib. 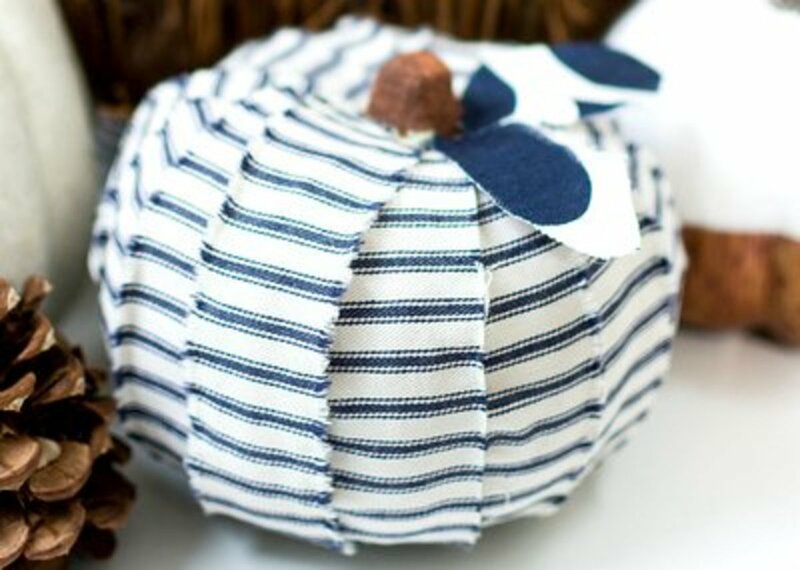 Imagine all the beautiful pumpkins that you can make with your fabric scraps. I love this project. This scrap fabric craft idea is one from the IT ALL STARTED WITH PAINT site. Think about a friend, a parent or a grandparent and you'll see that any one of them would appreciate this gift. Find the instructions and pattern for making this sunglasses case at Positively Splendid . I think an arrangement with different height trees would be very attractive. I certainly like the looks of this ball covered tree. 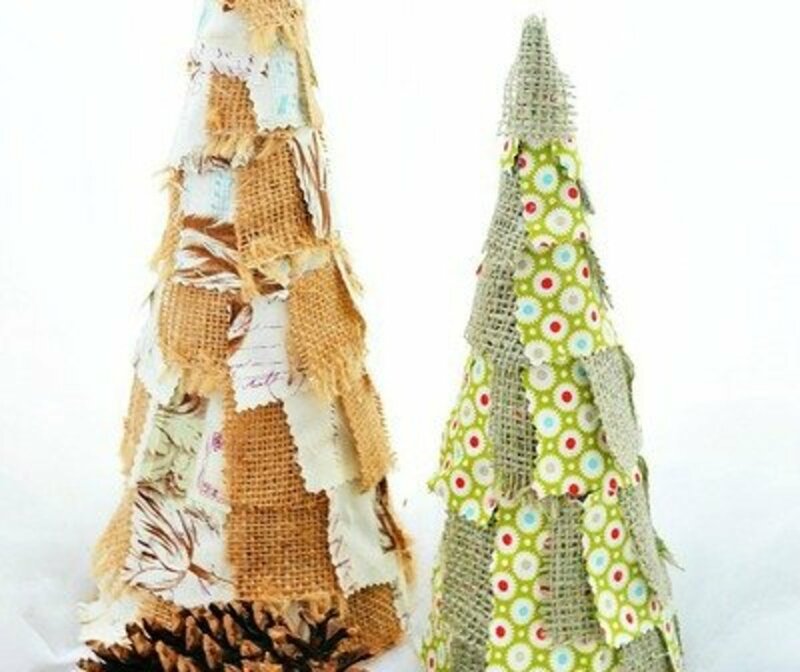 Imagine using different fabrics for different sized trees, but grouped together on a table or shelf. The tutorial for this craft project is found at live laugh rowe. Mother's day or Father's day are just two occasions when you could make and give a bouquet of flowers like this. 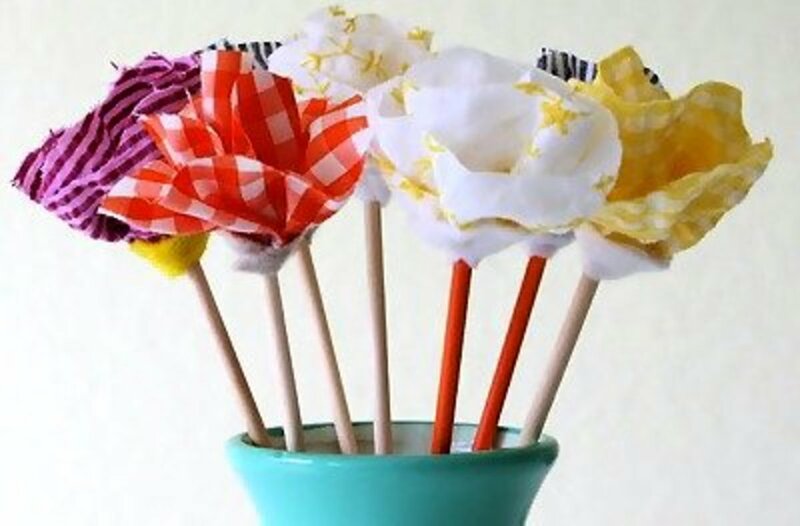 Find the tutorial for making these no-sew flowers at Made Everyday. 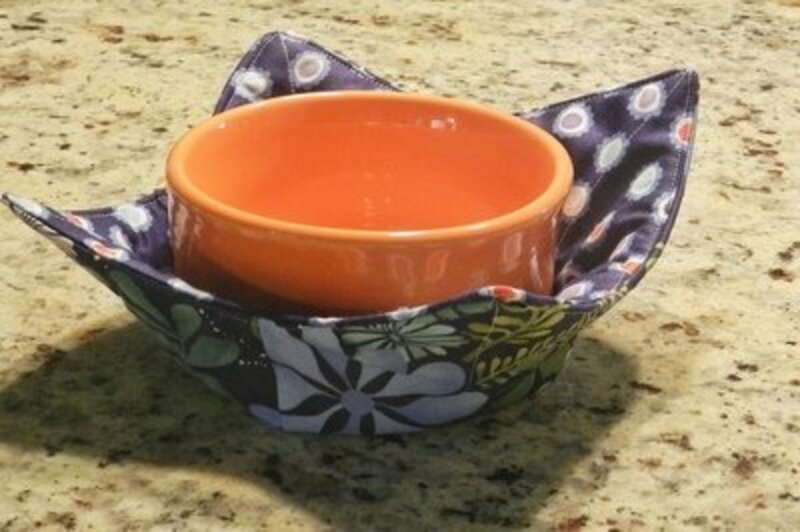 I've seen a number of different ways to make fabric bowls, but this one is my favorite. You'll find the instructions at craftstylish. Aren't these little owls just adorable? Go to Happy Hooligans for the instructions and then get out your fabric scraps and have some fun. Even if you start out making coaster by following the instructions at Sometimes Crafter , soon you'll see how easy it is to make coasters and you'll start designing them on your own. 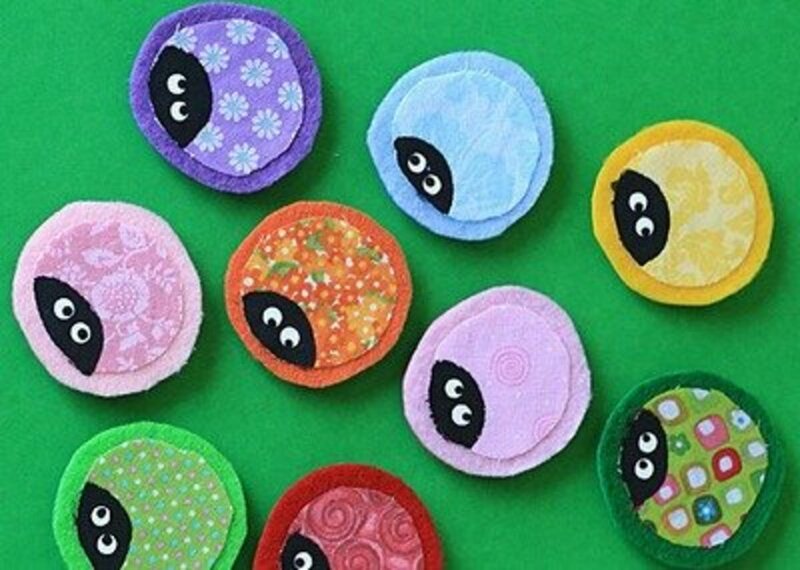 Your fabric scraps are unique to your sewing, so your coasters will also be unique. How many times haven't you wished that the baby had some nice quiet blocks to play with and chew on? 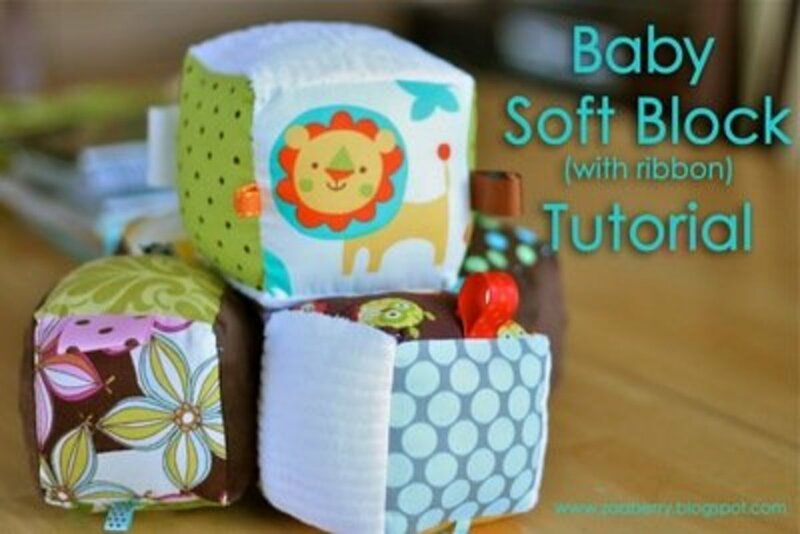 Follow the directions at zaaberry to make soft blocks for your own baby, and then make some to give to a new mother. A great baby shower gift idea! 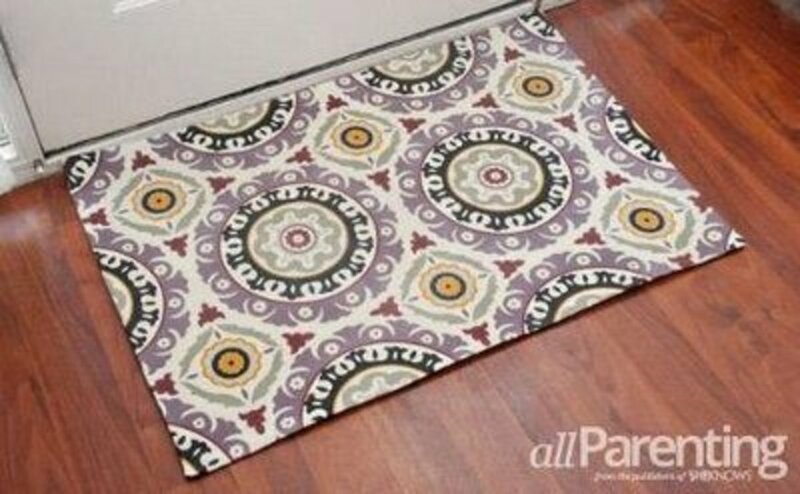 Sometimes you'll have a fabric scrap that is large enough to use to make a door mat, so you can go to allParenting for the tutorial to make the rug I think this idea is good for a colorful bedroom rug. 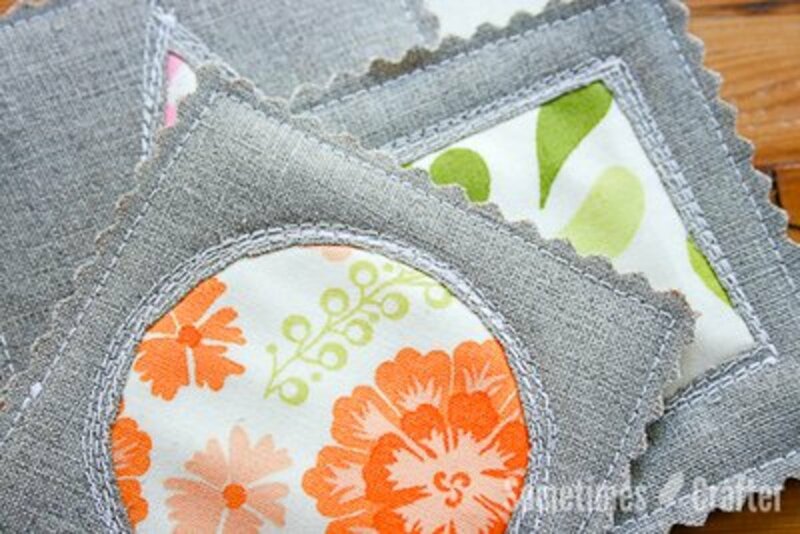 These fabric scrap baby bibs are so easy to make that you'll want a bunch of them. Make them to give as baby shower gifts, the new mom will love them. 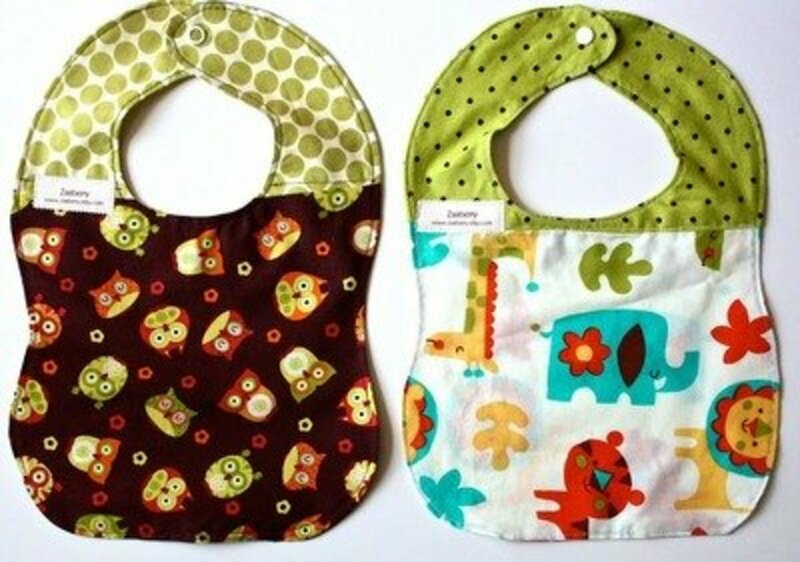 Find the instructions for making these bibs at zaaberry . Who wouldn't just love to have one of these long pillows? 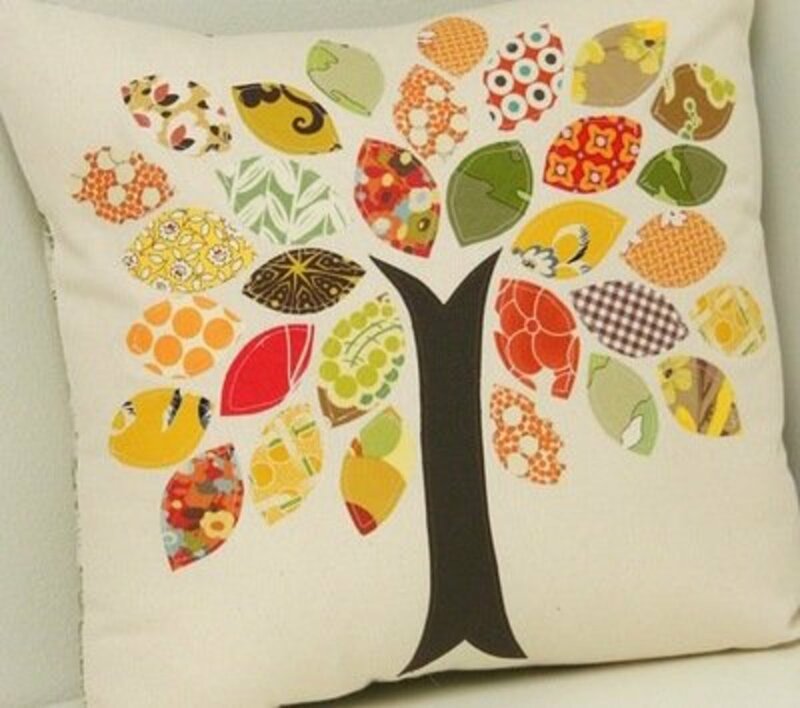 Think of making pillows like this for holiday giving and for graduation gifts. Find the tutorial for making this lumbar pillow at The Handmade Home. 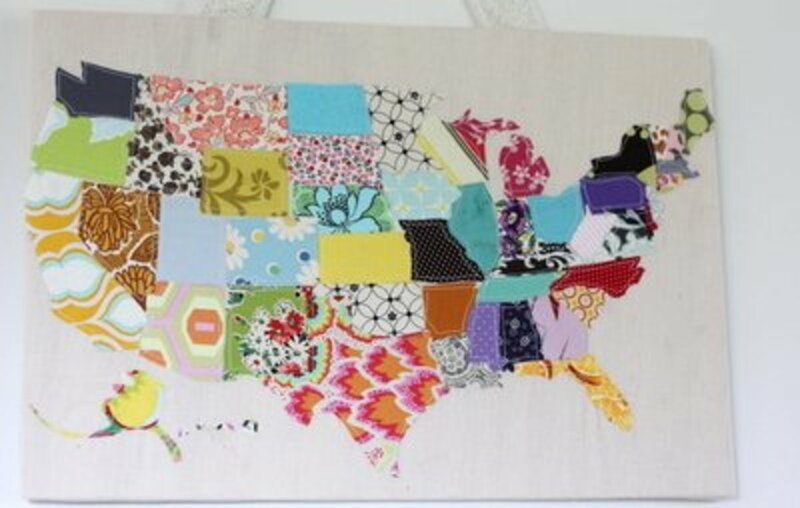 Although I like this map wall hanging as a piece of art for the home, I think a teacher could use this project with her class as a fun way to learn where the states are. To make this project, with so many possibilities, go to SeeKateSew. 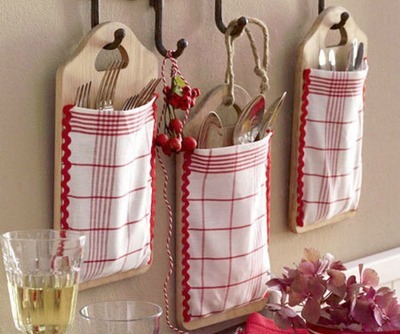 This is such a cute and easy idea for a way to decorate the kitchen. Not only is this a great storage idea, it looks very attractive also. Find the tutorial for making this DIY kitchen storage idea at Mac Cutting Boards. 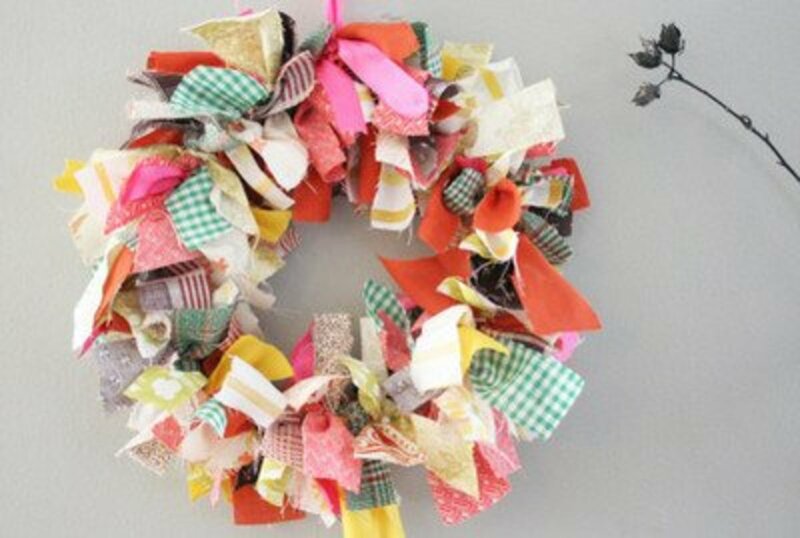 Use lots of different, pretty fabric scraps to make this wreath. Let the kids help make this, they'll feel so proud of the finished wreath when you display it on the door or wall. The instructions on making this rag wreath is found at HUFF POST HOME. 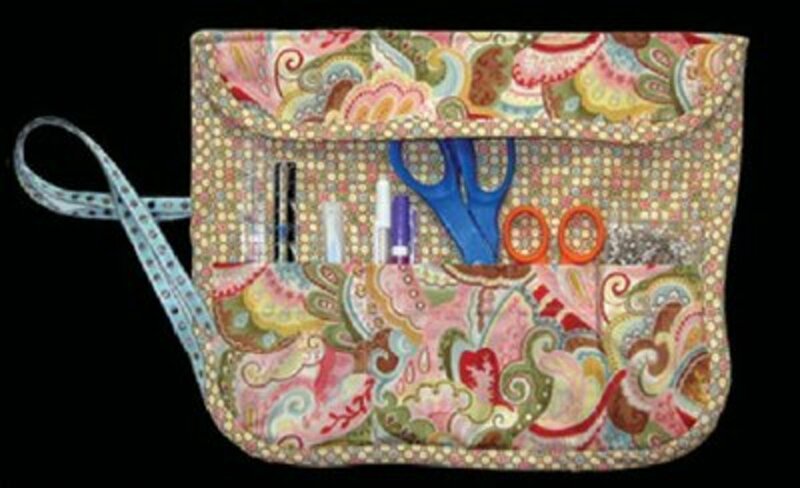 Use up scraps of fabric and make a nice useful sewing case. 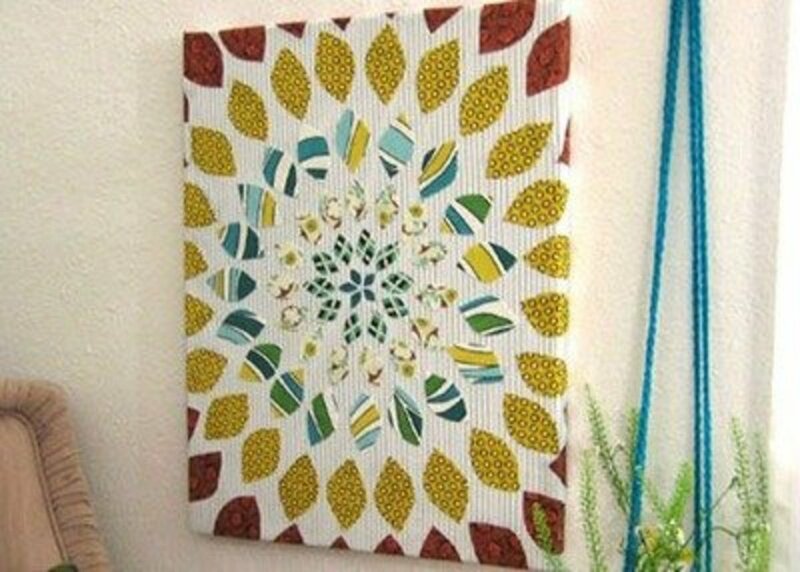 Follow the tutorial at Craftster to make this project. If you make crafts to sell, consider this as an item to make for a craft show. 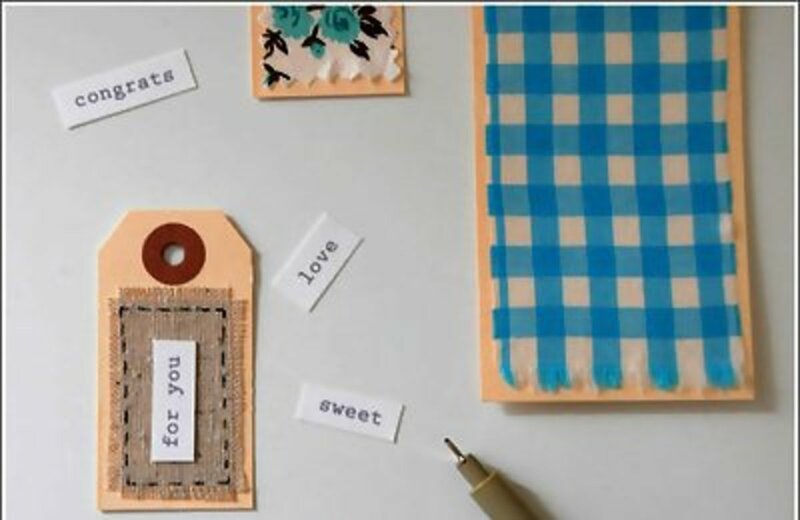 It'll be so much fun making the gift tags that you'll want to make them for Christmas gifts, graduation gifts, shower and wedding gifts, Valentine's Day gifts. The instructions for making these tags is at Creature Comforts. A super simple project that is not only cute as can be, but also useful. The tutorial is found at Stumbles and Stitches. Not only little girls love to wear scrunchies, teen and moms do too. Make a scrunchie to go with any and all your outfits. Go to Duni’ Studio for the instructions and then get out the fabric scraps. Make scrunchies for Christmas, Halloween, Thanksgiving, Valentine's Day and the Fourth of July. 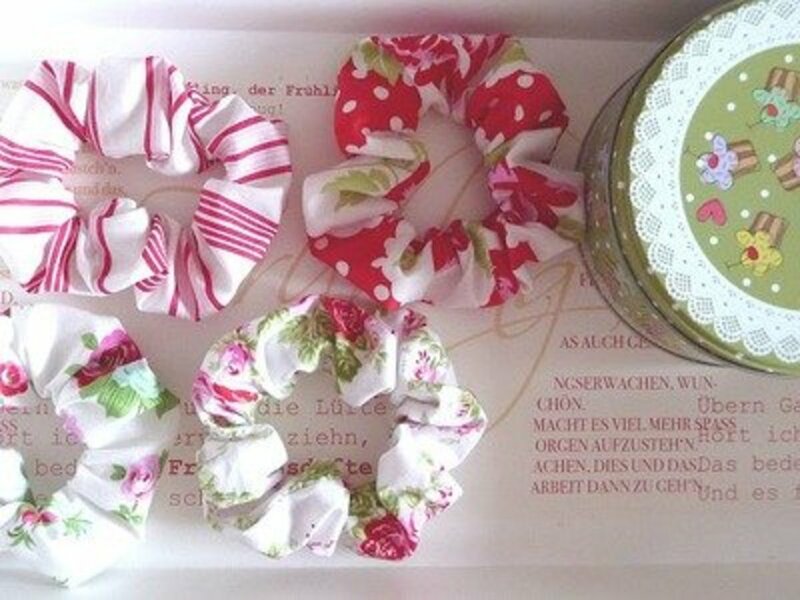 Make bunchies of scrunchies. By following the instructions at How About Orange you'll be able to fancy up even your thumb tacks. Use up all those tiny, but beautiful, fabric scraps. Sometimes we forget that we can use fabric to make wall art. This example, with instructions at Hey Now, Whoa Now! is what can be done with a little imagination. 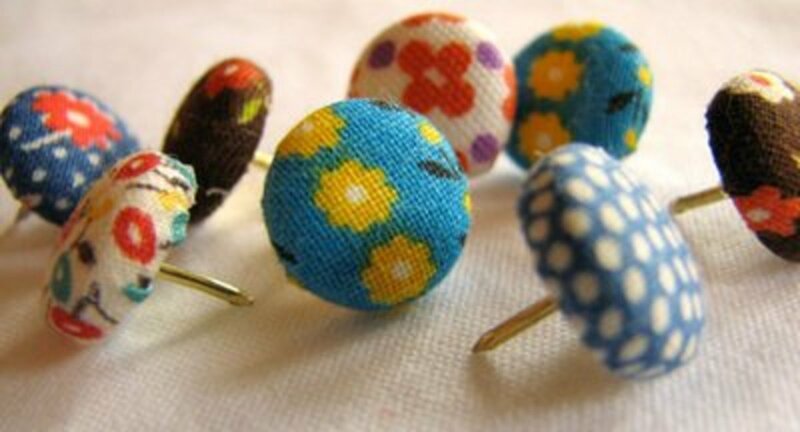 Find the tutorial for making these pin cushions at Sometimes Crafter. I absolutely love these little Christmas trees.The instructions are found at the picket fence. 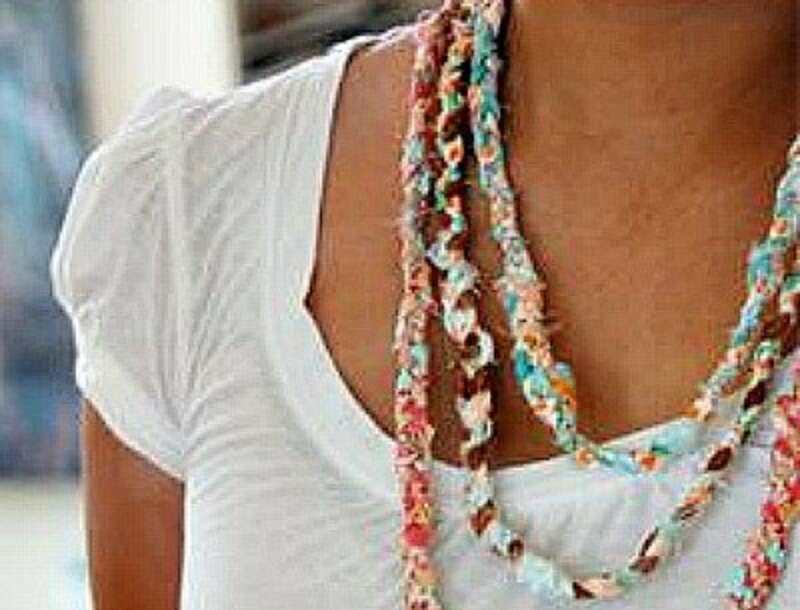 Scrap fabric necklaces are perfect to wear with white or plain colored t-shirts or blouses. This very nice project is found at smaller magazine . 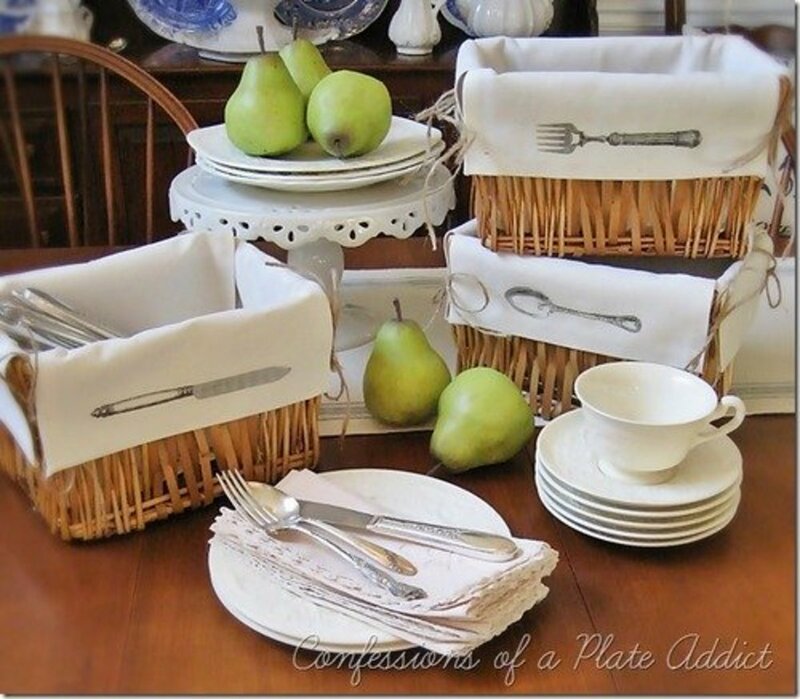 This is a great way to use fabric scraps. 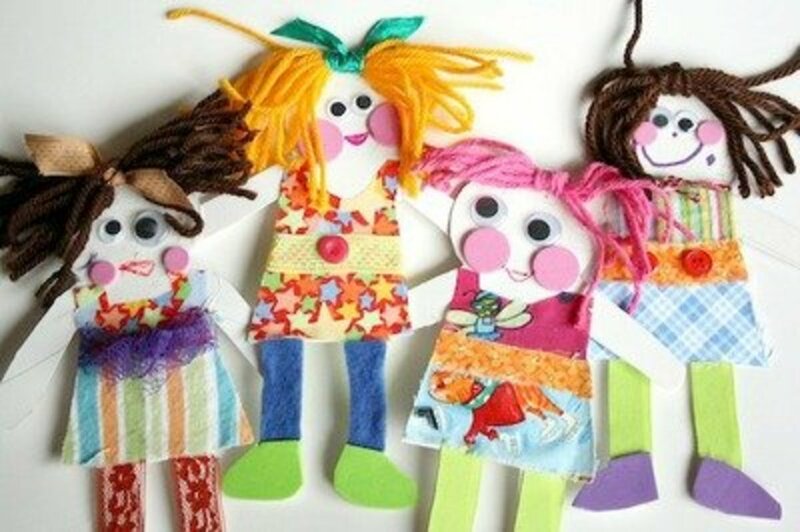 I remember making paper dolls as a little girl, so I know girls will love this project. The instructions are given at Happy Hooligans. 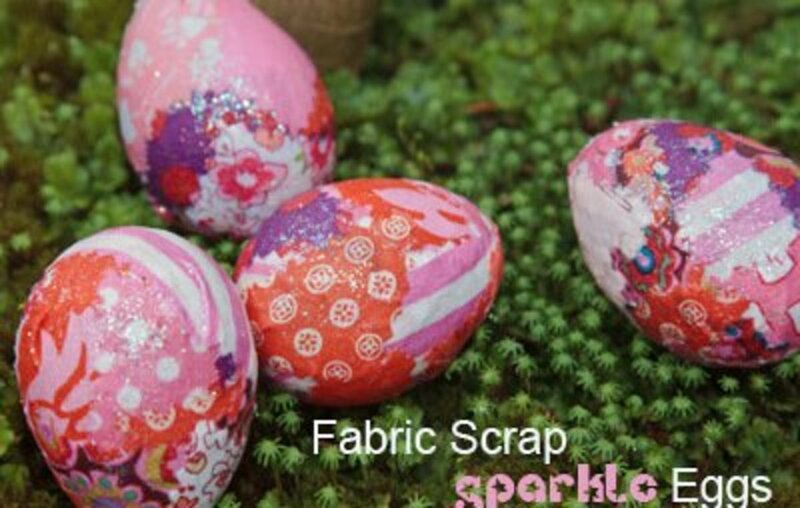 These fabric covered eggs sparkle with the help of glitter. 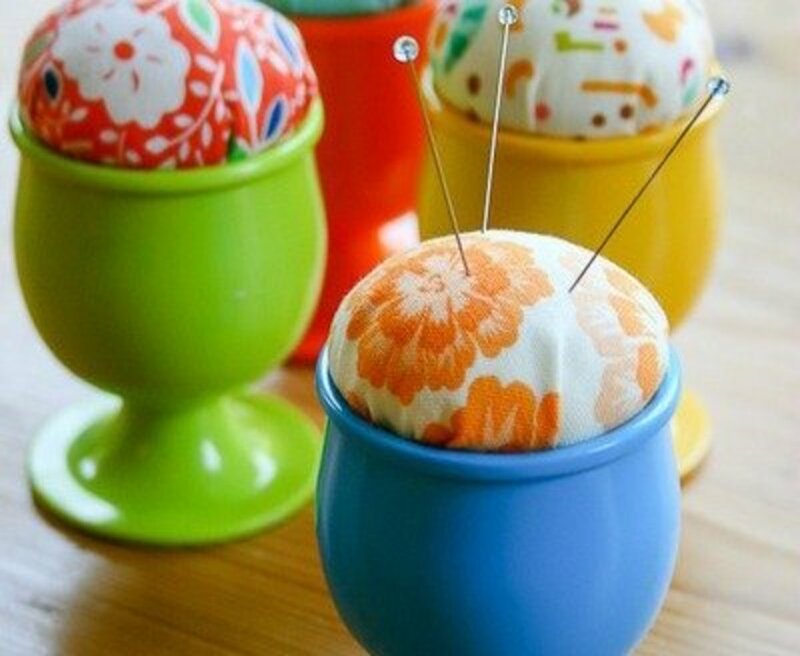 Find the directions for making these beautiful eggs at sew mama sew . 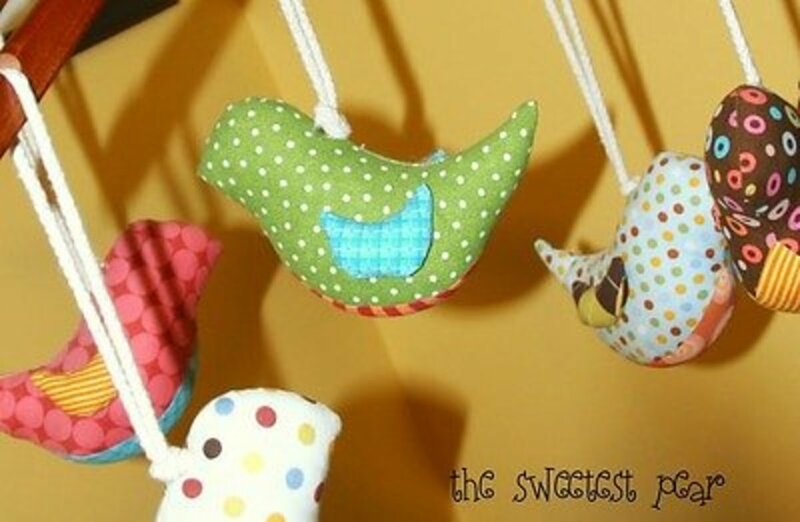 Fabric birds are so beautiful that you'll want to make more than just the ones for the mobile. Consider adding a skewer or wire to the bottom of a bird to use it as a plant pick. I love this project, you'll find the tutorial at THE SWEETEST PEAR . 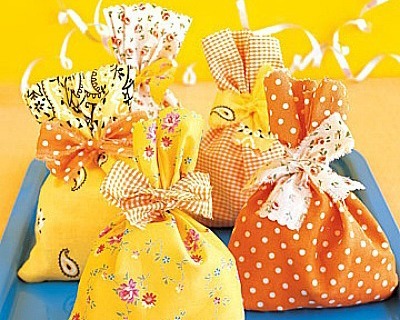 If you have Halloween themed fabric scraps, make these little favor bags to hold the Halloween treats to give out to the ghosts and gobblins that come to your door. The instructions are found at the Martha Stewart site. 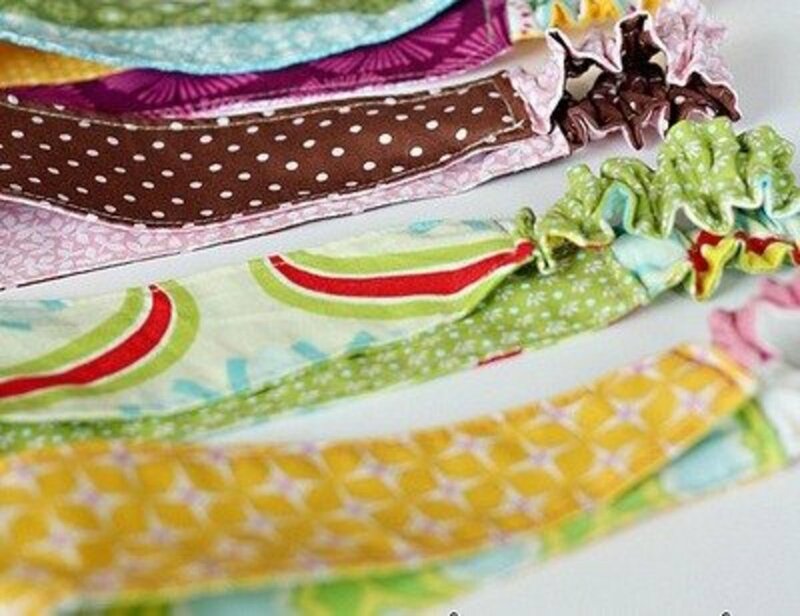 Double sided headbands are always a great item to sell at craft shows, especially near the Christmas holidays. 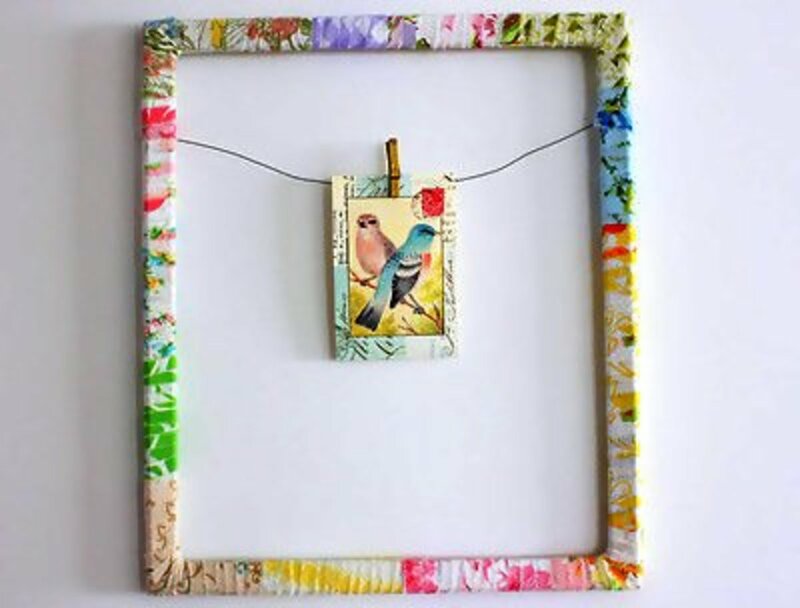 Find the tutorial for making this project at happy together . This is a project that the kids can easily make. 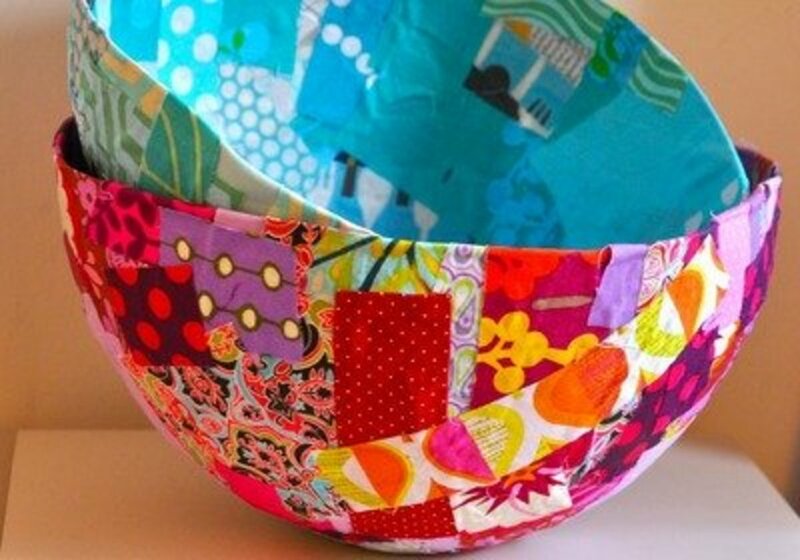 Find the instructions at J&O FABRICS and then let the kids choose fabric scraps to make a bowl. 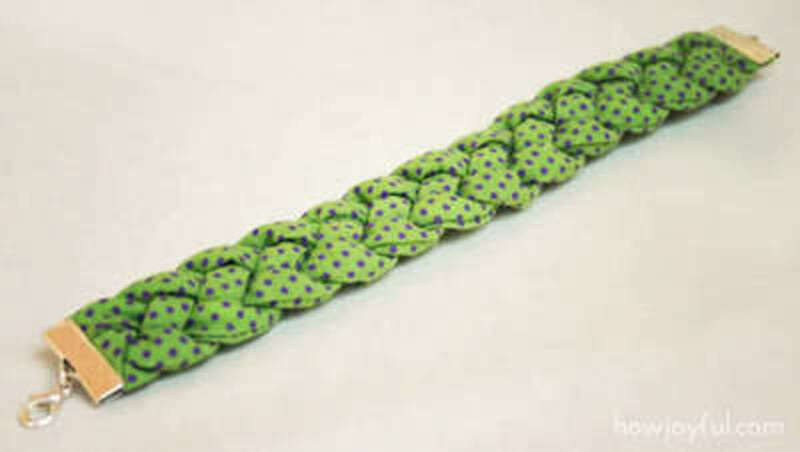 This braided bracelet looks like it might be difficult to make, but when you go to howJoyful for the instructions you find that it isn't hard to make. 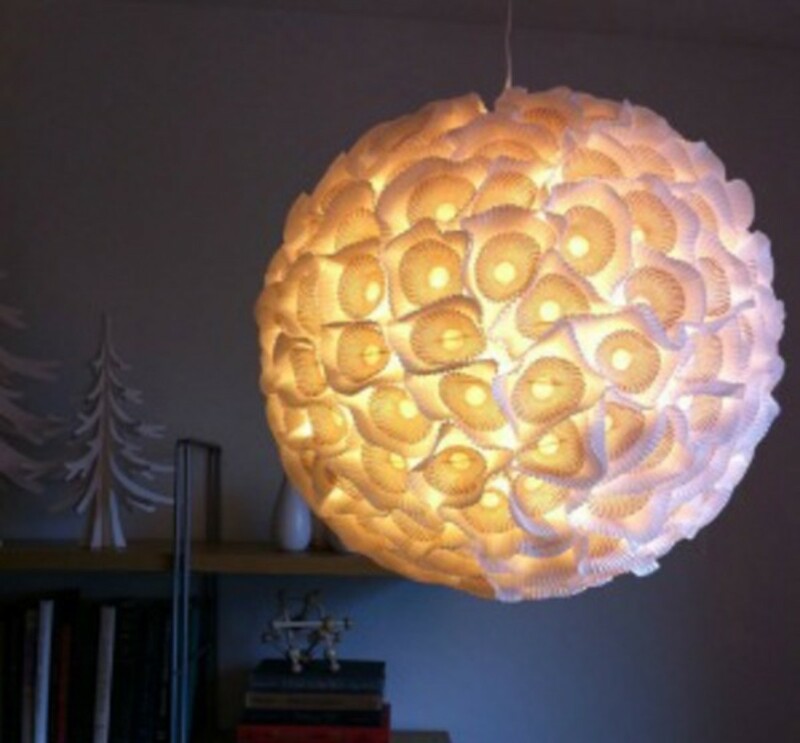 A nice craft project for teens. Sometimes the simplest project can be really impressive. This wrapped frame is an example of how nice it can be. Find the tutorial for this project at JaneSays . 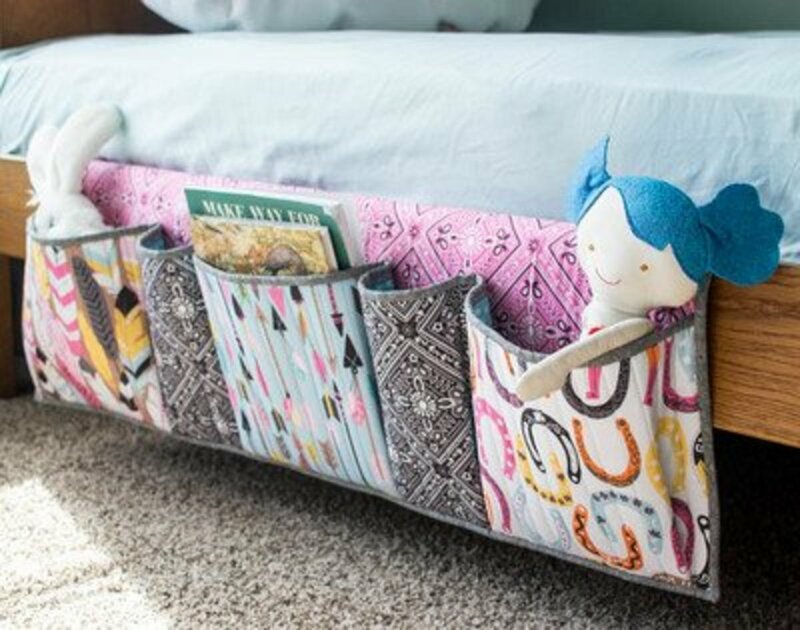 See how easy it is to make this bedside organizer by going to Sew Can She for the directions. 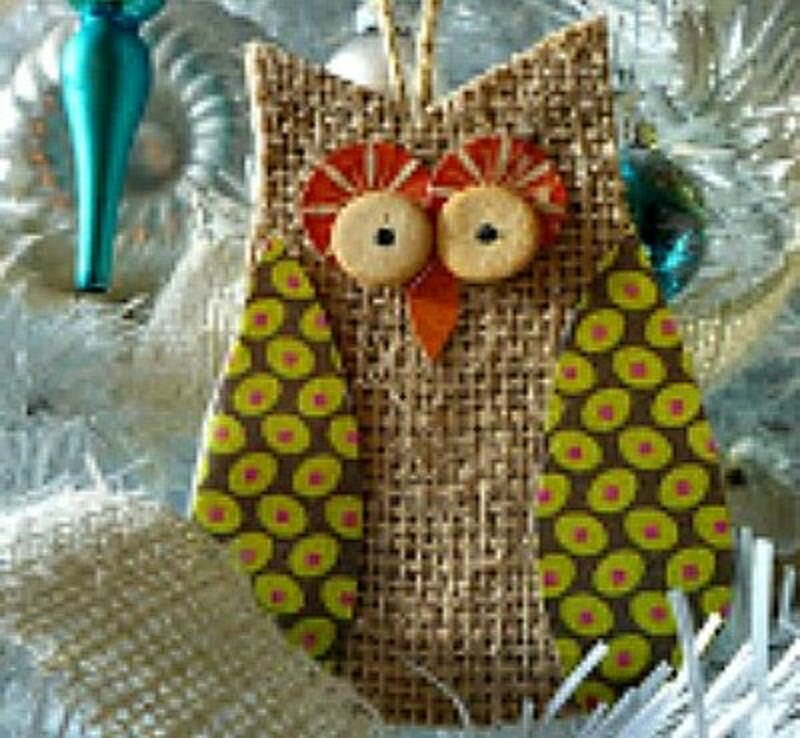 Dress up a rather plain burlap owl by adding colorful fabric wings. 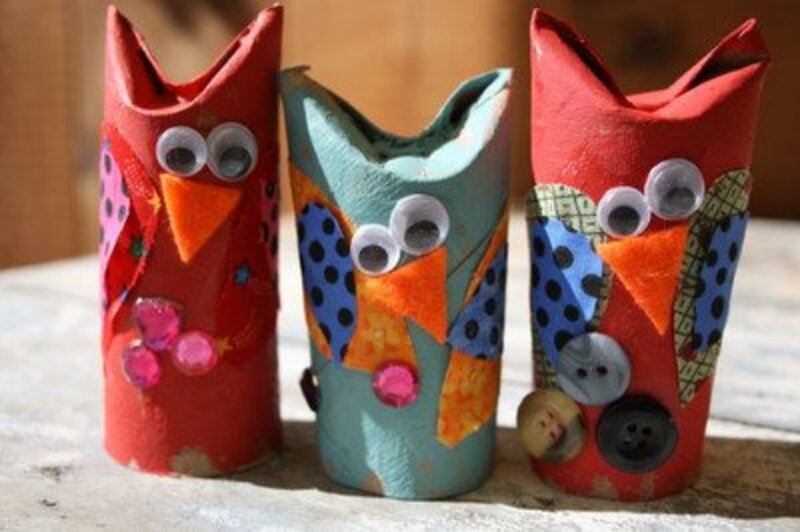 See how do make this owl by going to Flea Market Trixie for the instructions. 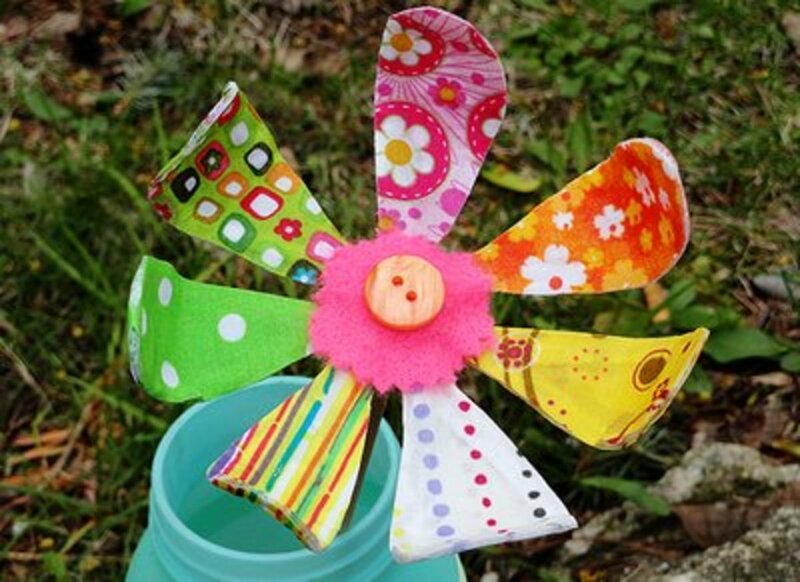 This whimsical, bendable flower, with a tutorial at CRAFTS BY Amanda is easy to make, and oh, so cute. 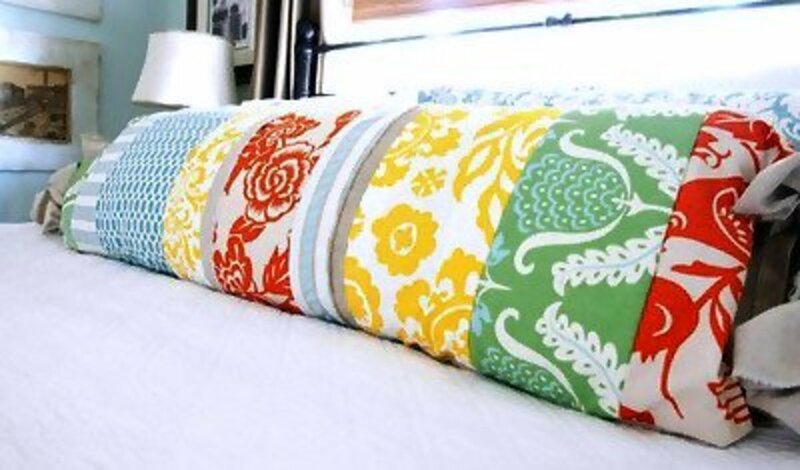 Pillows are a great way to use up pretty fabric scraps. Look at coloring pages to give you ideas on what to applique or glue onto your pillow. The instructions for making the pillow shown here is found at Cluck Cluck SEW . 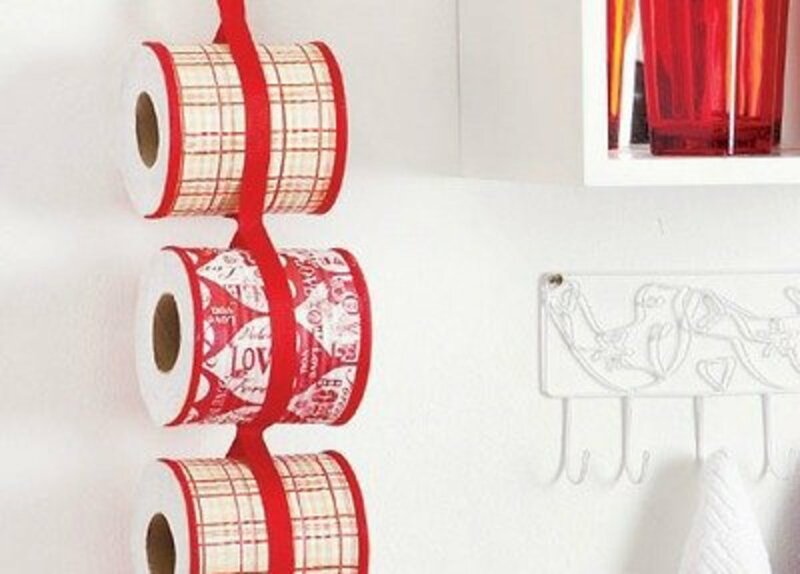 Displaying extra rolls of toilet tissue usually isn't something we want to do, but with a cute holder like this one, it looks like a good idea. 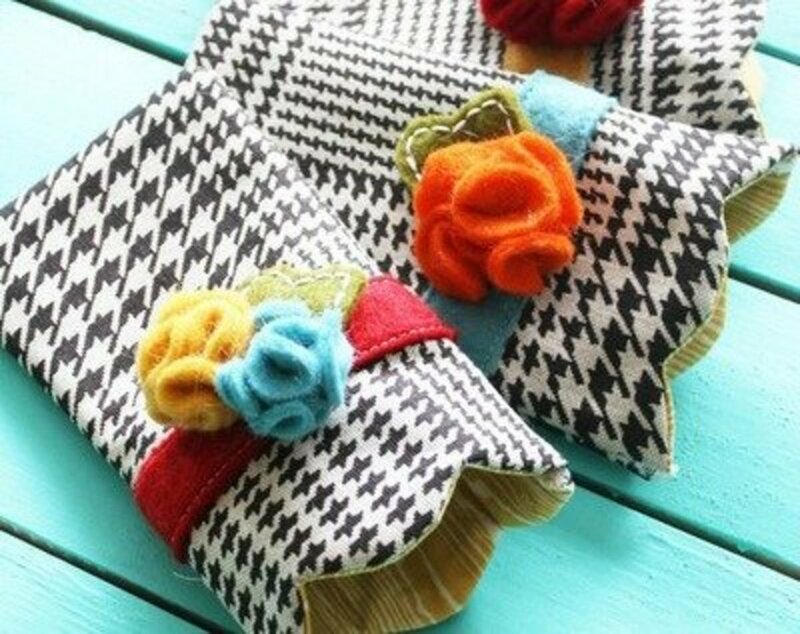 Find out how to make this tissue holder by going to DIY Enthusiasts. Would you believe that tin cans are used in this project? Lady bugs are a very popular craft, and you can see why when you notice these lady bug magnets. CRAFTS BY Amanda the easy to follow tutorial. This is a gift that all your friends will be happy to receive. Find the pattern and directions for making these potholders at Seams Happy. 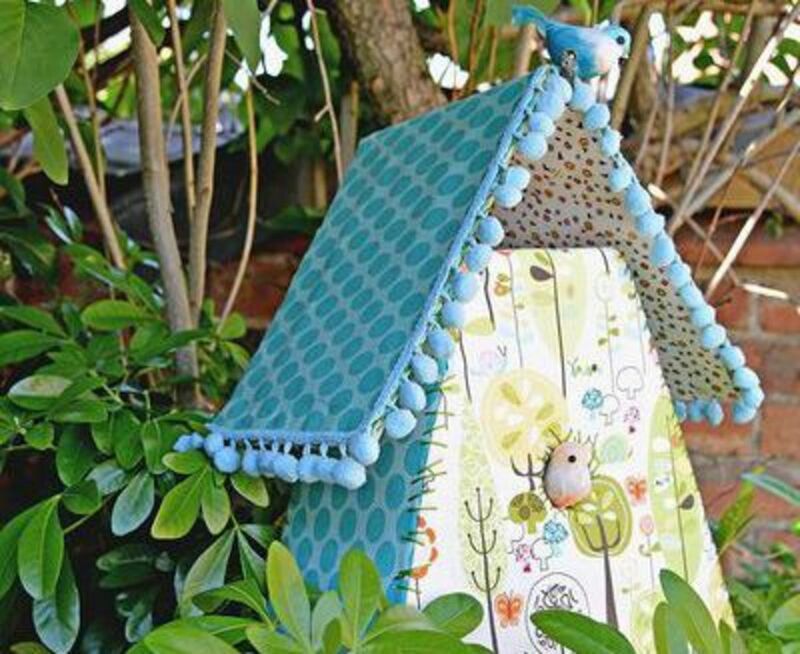 Make beautiful birdhouses by following the tutorial found at Home Talk. 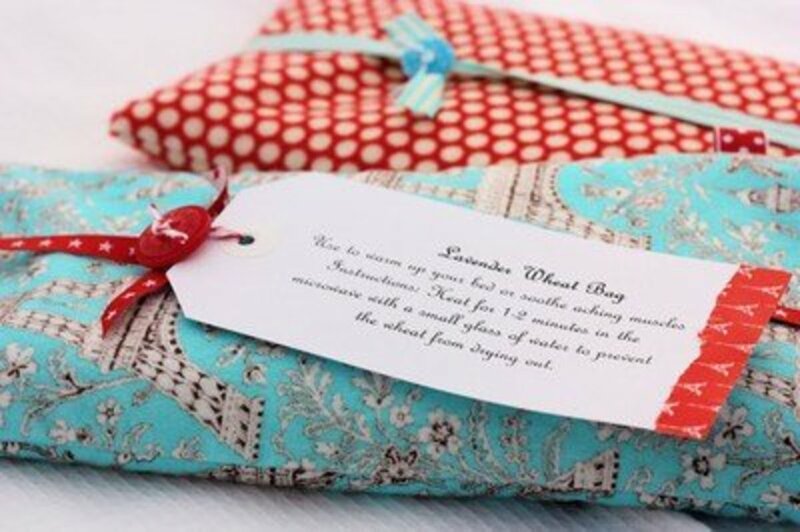 Use flannel, fleece or cotton fabric to make these comforting heat packs. You'll find the instructions at A Spoonful of Sugar. I've used stuffing pellets in the Boo Boo bags that I made for my grandkids. What a great round up of projects for me to keep in mind while I introduce a young friend to sewing. My primary goal right now is to help her love the craft. Thank you ladies, for your comments and up votes. I like your "by the ac" idea for making crafts, Susan. Especially today when it's over 90 degrees and not yet noon. MizBejabbers, I like how you used an on hand fabric for making your eye glass case. There are so many colorfully designed fabrics, as poetryman remarked, that we want to use up all the scraps. Crafts are fun and useful! Some beautiful craftiness here. Voted up. I love the colorful designs. You have some wonderful ideas here, and I love the fact that you’ve listed sources to make these. I paid about $20 for a book to make fabric bowls years ago and never made a single one. 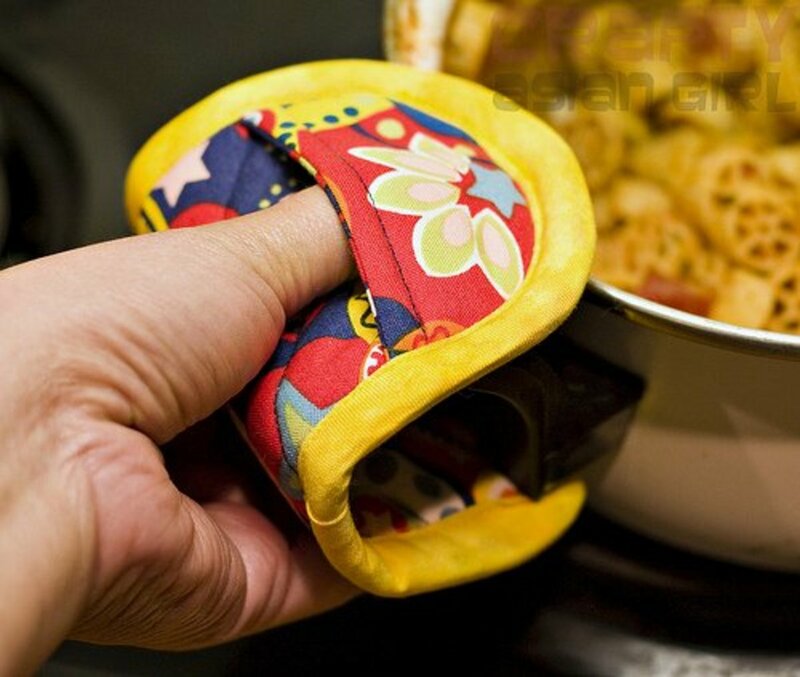 I’ve made some of these ideas in the past, such as the pot holders and pin cushions. I like the eyeglass holder, too. I made one once out of the foam strips that are used in children’s crafts. I had eye surgery and was given “monster” sunglasses to wear for awhile. I took an 8” x 10” piece of red foam and cut the shape. I used a paper punch to punch the holes and sewed it together with thin white ribbon. Then I glued on pre-made foam flowers of various sizes for the decorations. I think I may still have that old thing lying around somewhere. I liked the fabric-covered thong sandals. Back in the Peter Maxx days of my youth, I covered a pair of three-inch spike heel pointed toed shoes with fabric to match a dress. I got a lot of compliments on them. 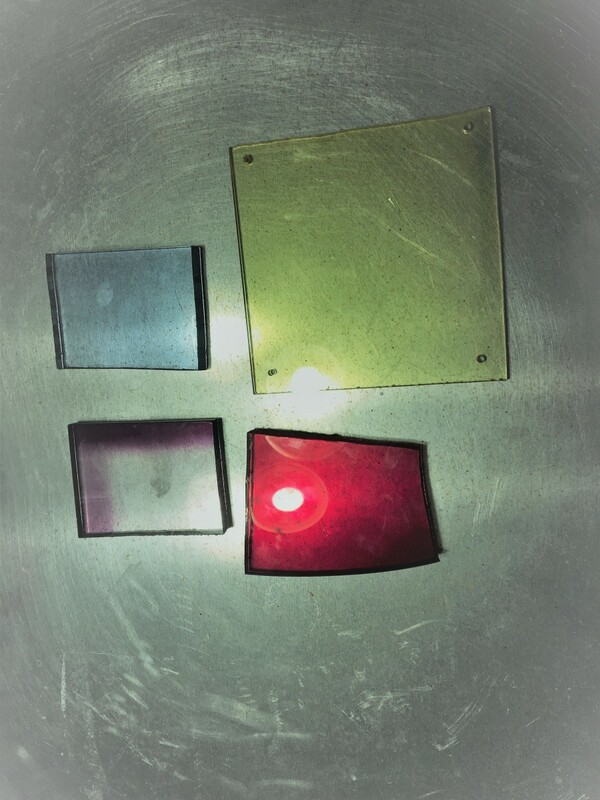 I intend to make the bracelet you displayed in one of your photos. Thanks, ladies, for your comments. I don't know about you, but I always have plenty of fabric scraps to make something from. I'm not a quilter, I don't have the needed patience, even though I do love the quilts. Ooops, it was pin cushions. No, they are probably not saved. Our house was flooded when I was a teen, so a lot of stuff was pitched after that. It sounds like it was fun to cut paper dolls from the catalog. Kids can be so creative. 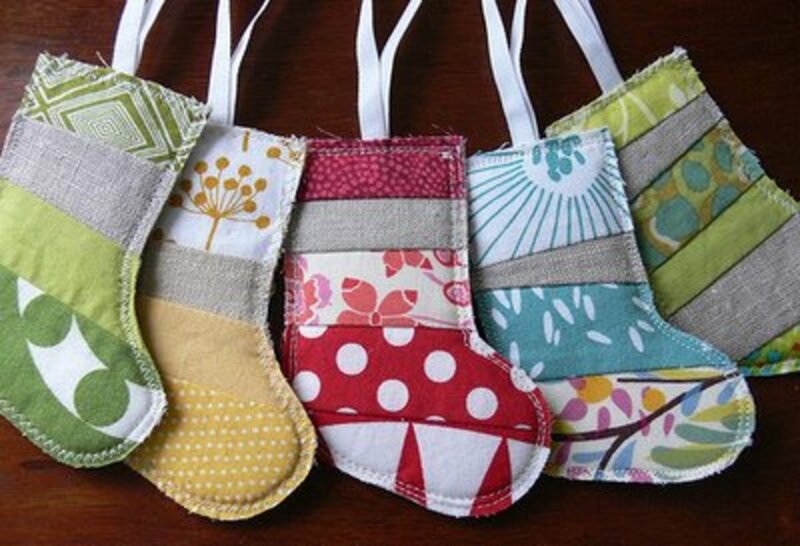 Very cute fabric crafts. Love the creative ways found in which to use the fabric leftovers. When a person sews, (I know because my mom does) there is always lots of scraps. These are great ideas to use them on! Hi Cheryl. Thanks for your visit and comment. Did your mom save any of your pink cushions? Don't you love the memories? Wish I had thought about the paper dolls with fabric clothes. My sisters and I just drew our own paper doll clothes. Of course our paper dolls were pictures cut out of the catalog. One thing we did have was lots of imagination. These ideas are lovely and very creative. My favorite here is the baby bib with ruffles on it. When I was a kid, I used to use empty walnut shells as the base for pink cushions that I made for my mom. Thank you, Ann for your visit and comment. Who would have thought those fabric scraps were good for something besides quilting. Beaddoodler, thanks for stopping by. I hope you found an idea that you'll want to do. Thanks for visiting this hub and your kind comment, Audrey. Key chains also make great gifts. Wow, I knew there was a reason I hoard all my leftover fabric! Thanks for ideas. I'm going to bookmark this page. 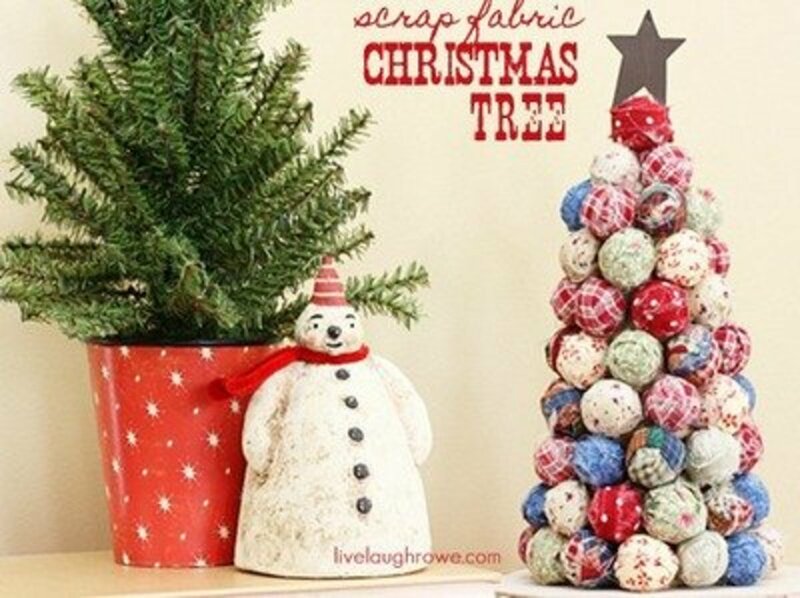 So many wonderful ideas for using up fabric scraps. Thank you for sharing! You have great ideas! I love this, especially the key chains!